"Now the time has come for me to say good-bye…." 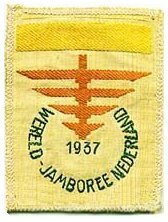 In the summer of 1937, the Scouts of the world gathered together at Vogelenzang, the Netherlands, for the Fifth World Jamboree. Already the storm clouds of war were forming. It was to be the last such gathering for ten years. It was also B-P’s last jamboree. American Scouts march past the reviewing stand at the Opening Ceremonies of the 5th World Jamboree. (Photograph from a contemporary newsreel). Scouts of the Empire and the Commonwealth pass in review Opening Ceremonies of the 5th World Jamboree. (Photograph from a contemporary newsreel). The National and World Jamboree in Pictures provides "a permanent record not only with everyone who attended the Jamboree, but with other Scouts and Scouters … to insure a continuation of the values of the National and World Jamborees…. The World Jamboree pictures are largely from a collection secured by Mr. William Hillcourt from professional photographers, as well as amateurs, in Holland, supplemented by pictures loaned us by Scouts and Scouters from America who participated in the Jamboree." — James E. West, Chief Scout Executive. The Scouts of Bronxville, New York (now Westchester-Putnam Council) at the 1937 World Jamboree at Vogelenzang, Holland. The Netherlands issued a special series of commemorative stamps honoring the 1937 World Jamboree. They feature Scouting images. The Boy Scouts of America held their 1st National Jamboree in July, 1937 just prior to the 5th World Jamboree at Vogelenzang. Home Page of the 1st National Jamboree provides links to an extensive gallery of photos and articles about the Jamboree. Your feedback, comments and suggestions are appreciated.